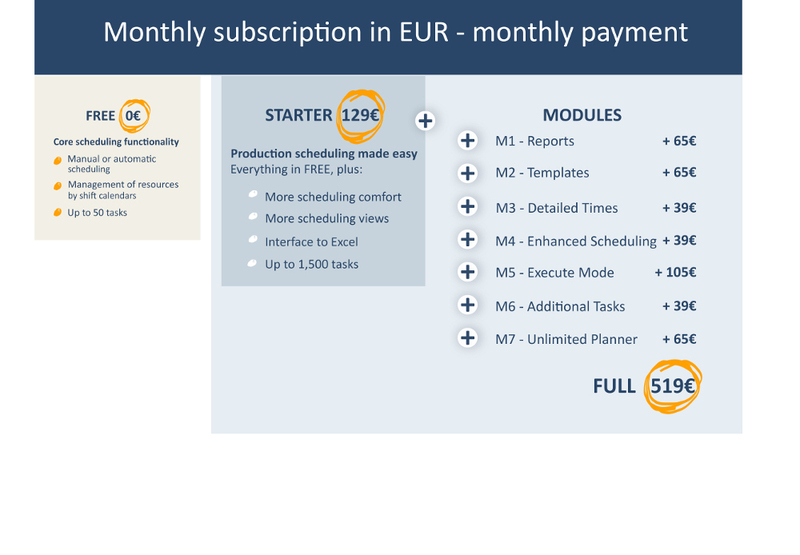 Modular pricing: pick those modules that you need and just pay what you use. Simple, transparent, no surprises. Add functional modules to your Starter plan and configure the software that suites you best. Just pay what you need. We honor customers, and we honor customers who are willing to move fast. Hence, we offer a lifelong price guarantee. This means: If you purchase a product plan at a time t, the monthly fee that you have to pay for that plan will never change. This is even true, if this plan over time gets new functionalities and if the plan's price increases for new customers. The monthly fee only increases if you switch to another plan or order additional product options. A plant is a set of production resources that can be controlled and scheduled as a unit. Typically a plant corresponds to a physical factory, respectively a manufacturing location. Additional plants are priced at a 50% discount. A task is a single operation which gets scheduled. A production order (job) can consist of multiple tasks. Active tasks are all tasks shown in just plan it as a bar. As user of just plan it, you can add, delete or change tasks at any time. A user is any person who uses the software. In our pricing plan, we do not differentiate the number of users working with the software. Means: you can have as many of your people using the software as you like. However, we differentiate between the planner and the viewer user. Difference between planner and viewer? A planner is entitled to make changes to the schedule, and to take action in case of conflicts. With changing the schedule, the planner has the right to change the underlying database. The viewer enjoys the exact same functionality of the software - with one exception: he cannot make changes to the schedule. Free means free, and it means free forever. The FREE plan brings you some basic scheduling functionalities and it is limited to a maximum of 50 tasks. If you need more, or if you need more advanced functionalities, you have to switch to STARTER. However, we do not force you to go there. If you get along with the FREE plan, are are fine. How can I unlock and test modules? You can change from FREE to STARTER under settings. This starts a 30 days trial. After that, you can go back to FREE or have to pay us. When you are on a STARTER plan, you can unlock modules under settings as well. The price includes the usage of the software, enhancements of the software (if within the ordered package) and support via email. Easy production scheduling for job shops and machine shops. Easy-to-understand, fast-to-learn, no implementation hassle.